Hello and welcome to the first development update after the fork/swap. This will highlight what is new from the fork, the progress since the fork and most importantly what is next. Short answer?A lot. We changed the entire base code from Groestlcoin over to the latest Ravencoin build. We did this because the Groestlcoin was not friendly for future updates or forks and we moved to Ravencoins code because it is clean, flexible and it contains a lot of prebuilt features such as assets. Mynt now supports on chain assets on two layers below the Mynt blockchain. These are Assets and Sub assets but also Unique assets exist as a separate layer. We will go into more detail about assets in a future post. We also added a 5% founders fee to the blocks due to the communities demand. This will be allocated to the development fund which will allow us to gather a fund to seek exchanges and bounties. What has happened since the fork? The dust has finally settled and the work is beginning. We had to build a new explorer, pools, wallets & miners. 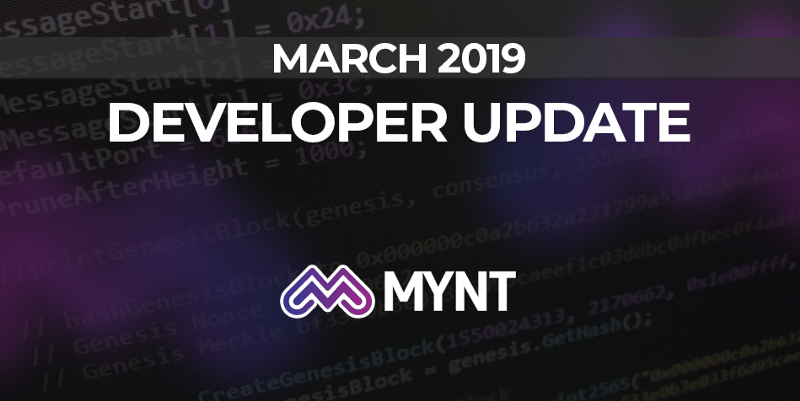 Now this is complete we are moving onto items such as an Insight explorer which give developers more freedom with what they can make for Mynt. The Insight Explorer is an all singing and dancing block explorer with lots of features for developers to build upon. It has a complete REST and Websocket API for quering blocks, transactions, and addresses; and receiving live updates, Reports on double spend attempts, outpoints confirmations, outputs spend status reports. Input and Outputs hyperlinks in transactions. Extended view in transactions to show advance details. This will make developing using Mynt a lot easier. With the insight working it will path ways for feature rich lite desktop & web wallets which can further enhance the cryptips experience as cryptips.org is created by the Mynt developers too. Cryptips.org is the first truly peer to peer crypto currency donation system that also includes paypal support to reduce loss of earnings allowing popular streamers to adopt crypto currency donations without losing their standard donation method. With no middle men this system is true to the concept of crypto. Swiftex has been going from strength to strength with recent additions on CoinPaprika and Coingecko. Mynt pairs have now been added too and a voting system with payment in Mynt has been implemented. This will provide a nice boost to the volume of Mynt for the future. Mynt Wiki has been created over at wiki.getmynt.io This will contain guides, information and news in one handy place to get the most current information. We have a lot of plans for Mynt and a plan to get there. It is along road and hopefully a smooth one. A new addition to the marketing side of Mynt, Sjoerd, is helping the outreach on a more professional side contacting exchanges and other contact for partnerships and uses. This is a never ending process so we are glad to have him working alongside of us. We intend to get more ground work done first. This is the insight explorer, lite wallets for use ability and mobile wallets snd applications. This starts the ease of use focus off to a nice start. Insight adds a lot of statistics and better tracking of wallets and transactions. Lite wallets allow users to use wallets without downloading the entire chain. Meaning quicker storage. Mobile wallets will allow Mynt storage and transactions on the go. Once these are completed we intend to push into a gaming focus and create sub asset systems for streamers. Imagine having your own coin for your community that users can interact with you using. Giving those coins out for user participation, viewing your stream and giveaways. This paired with Mynt focused support on cryptips will help Mynt become a name in streaming donations and user interaction. Messaging systems built into assets will come soon too but more information on this system will be added in the Mynt asset post soon. The open bounty system is still live and running with 2 bounties completed already which are the Mynt Mac wallet and design work on the new Mynt logo. These are outlined below in the other stats. The bounty system is designed for you to come to us and outline what you can do and we will agree a bounty if it is something desirable by us or beneficial to the community. Join the discord to find out more on this. Let us take a look at the socials. We have been growing steadily so here are the links and numbers.